August 23 2010: Happy 2nd Birthday Free Gaza! Lawrence of Cyberia has rounded some pictures and a handful of sentences about those who Israel killed when they attacked the Freedom Flotilla. This is who we lost. Lawrence also contrasted Israel’s pictures of “weapons” found on the Mavi Marmara with “Picture of weapons found during a cursory search of my kitchen and basement.” Sums it up perfectly. July 2: All decommissioners NOT GUILTY! Final two Decommissioners Found NOT GUILTY! The trial of eight anti-war activists, who decommissioned a Brighton weapons factory (EDO MBM) during the Israeli attacks on Gaza in 2009, is drawing to a close. The jury is expected to be sent out early this week (Starting June 27th) after closing speeches. On Sunday evening, May 30th, at 10.30pm, I was in bed reading. In bed with me was my mobile phone; it had taken me several days to understand how Twitter worked and set it up so I could receive FreeGaza flotilla updates, but I’d finally achieved it. Earlier in the day I’d spoken at a Transition Town event locally, taking advantage of a crowd to ask for people to do the same, to go online that night and witness the journey of the Freedom Flotilla, with a particular concern for 8am Monday morning when the boats would reach Gaza waters. When the Israeli navy had rammed and stolen FreeGaza boats in the past, it had waited until Gaza waters, daily occupied by its gunboats which weekly kill, injure and kidnap Gaza fishermen. 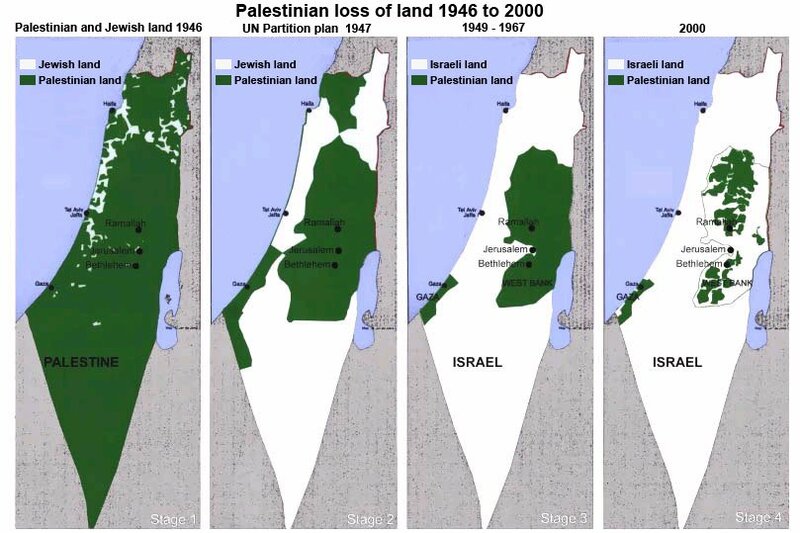 Click for a map of Palestinian loss of land 1946-2000. Get my RSS feed here.